Floating Lake Fountain Cost and budget considerations. 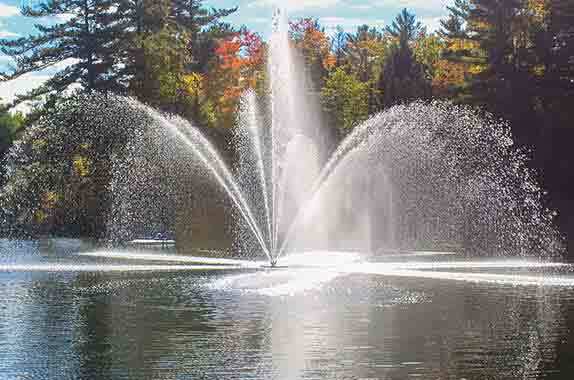 What is the cost of a floating lake fountain? This is one of the questions we receive regularly. Floating Lake Fountain cost has many variables and there are a few questions we need to ask so we can provide an accurate quote for your project. How big of a fountain spray pattern are you looking for? Water depth at desired fountain location? What power is available at shore? Approximate submersible power cable length required to reach fountain location from shore (allow twice water depth plus distance to shore)? Would you like lights on your fountain? What is your budget range so we can quote a system that will fall in your budget? Every lake fountain is unique and the the pricing is based on the above information. Spray pattern choice can be specified at time of quote or leave it for later as it doesn’t change the cost. We will provide you with the electrical requirements of the fountain. This will help so you can have your electrical contractor quote the power installation for your fountain system. Arbrux Limited floating lake fountain control panels are rated for outdoor use and are lockable. We wire all external connections to a terminal strip for a quick and easy installation at your location to minimize cost. We have a 2 to 10 Horsepower Lake Fountain Quick Install Guide that you can review to see how easy and cost effective the installation will be for you. If you have any questions we are always here to help to ensure you get the right fountain system for your project. We quote every project individually and we generally have something that fits within each customers budget. To receive a quote fill out a quote request or call our toll free number 1-888-211-3548. We will be happy to assist you with pricing.